I’m not a zombie aficionado – I don’t watch The Walking Dead, and I can’t make it through any of George Romero’s movies. I squirm at the classic horror stories – Frankenstein, Dracula, etc. 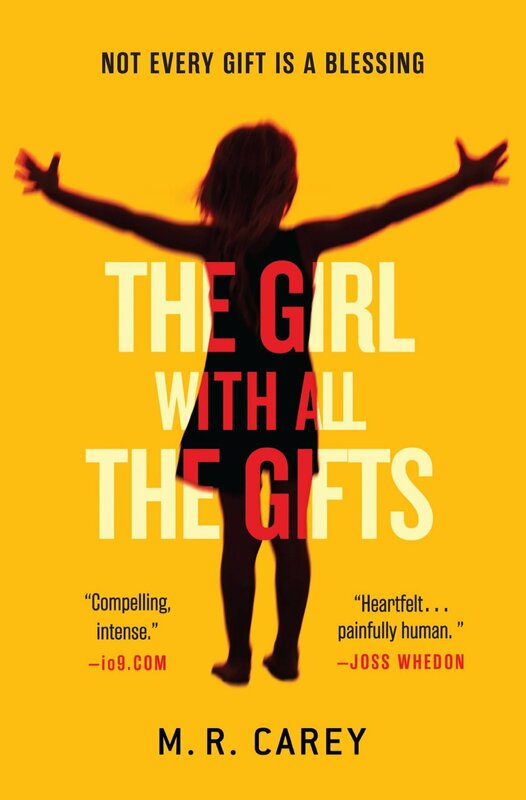 But damn if I didn’t love The Girl With All the Gifts, damn if it didn’t bring tears to my eyes, damn if it’s not a beautifully written novel about what it means to be human. Carey doesn’t waste time explaining what’s going on, or when his story takes place. The first half is told mostly from the point-of-view of Melanie, a 10 year-old girl in school. She spends her life in a cell, transferred to classes by soldiers who are careful not to touch her. We learn that Melanie is a “hungry,” the novel’s version of zombie. The world has been devastated by an epidemic that’s turned most of the human race into hungries, creatures that exist to destroy humans. Some humans remain as “junkers,” scavengers who create a new society of sorts, based on Darwinian mob rule. The remnants of the old society live under military rule in bases, where Melanie and other hungry children are studied. Something is up with Melanie and her classmates – they are able to learn; they don’t just want to hunt and kill. The novel’s plot has been described by some critics as “slight,” but this is a novel of ideas, and too much would distract us from the thinking Carey wants us to engage in. The language and situations are elegant – I was reminded of Charles Frazier’s Cold Mountain. None of the surviving humans are stereotypes, despite being introduced as such. It might not hold together except for Melanie, a brilliant creation – someone we root for yet remain unsure about until the very end. She is unsure of herself. I can’t remember when I was this moved by a genre novel – something firmly rooted in pulp/sci-fi, yet transcending that simple label to (perhaps) enter the realm of allegory, or fable. Of course it’s going to be a film. My recommendation – long before screenwriters mess it up, long before your interpretation is co-opted by Hollywood, read this book. Carey makes no compromises – the story comes full-circle to a satisfying and entirely logical conclusion. A rare book that has it all. Posted in Books and tagged Book Reviews, Books. Bookmark the permalink.